Russian cosmonauts stationed at International Space Station went on a short spacewalk to search for reasons behind a strange hole that had caused air pressure loss during summer of August this year but reason behind the hole on Soyuz MS-09 spacecraft that is moored to the station could not be established. Both Russian cosmonauts O. Kononeko and S. Prokopyev who will investigate the region will spend around six hours or so during the walk in space as they believe that the hole could have been caused by a drill deliberately. 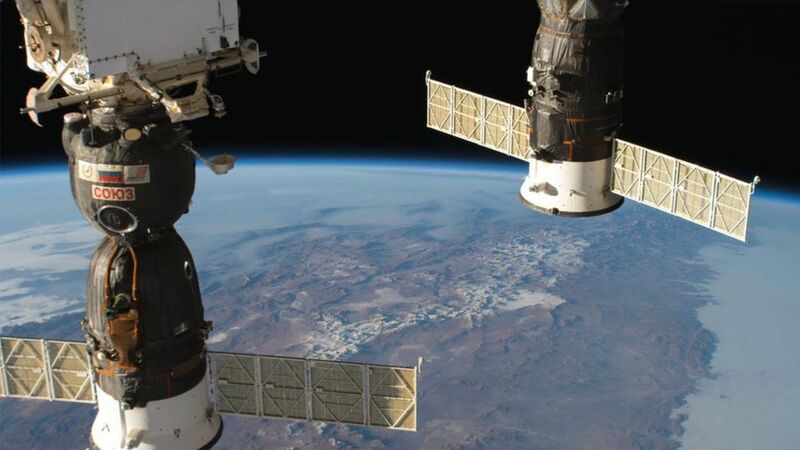 NASA stated that Kononeko will cut through the insulation and protective layers of the spacecraft Soyuz with a knife to find the source of the hole and samples will be returned back to earth. The procedure is likely to be complicated as spacecraft is not made to be repaired in space so does not have any railings that the cosmonauts can hold onto while checking the damage. Head of Russia’s civilian space agency Dimitry Rogozin described the adventurous spacewalk as complex and unprecedented. The strange hole was found when crew members found an air leak which was causing a bit of air pressure loss in the ISS and a tape was used to cover the hole. The Soyuz capsule was sent to deliver new cosmonaut crew to the lab that is located around 400 kms from Earth during June. Ship members speculated that the hole could have been caused due to impact of high speed rock piece flying through space but that matter was ruled out. Tass news agency reported that the spacecraft could have been damaged during test phase at Baikonur Cosmodrome based in Kazakhstan. This error could have been covered by some sealant to avoid detection but during the journey into space the sealant could have dried up and fallen off. Izvestia newspaper speculated that if the sealing material is found on the hull during the spacewalk than the hole could have been made when it was on the ground.